December 11, 2013: New Mexico State Aggies guard Daniel Mullings (23) drives to the basket in the first half in a game between No. 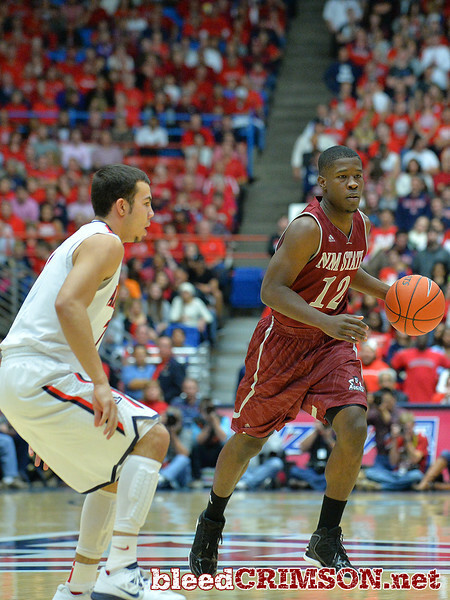 1 Arizona and New Mexico State at McKale Center in Tucson, Ariz. Arizona defeated New Mexico State 74-48. 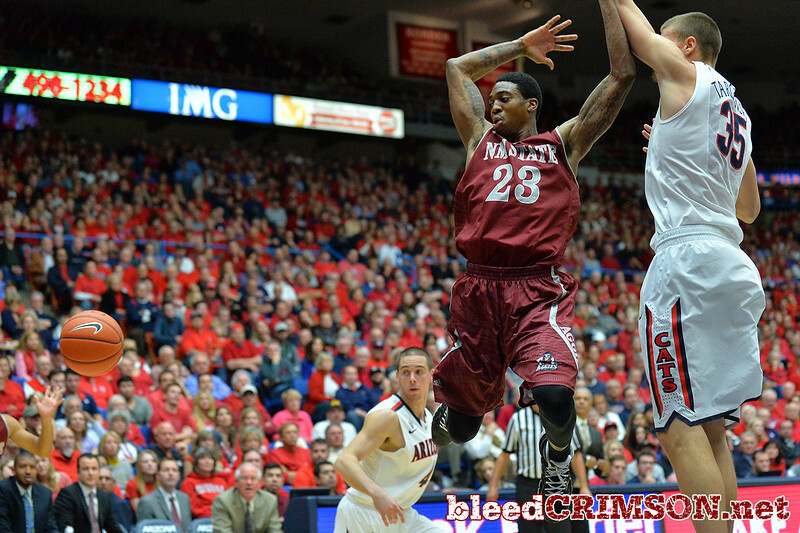 December 11, 2013: New Mexico State Aggies guard Daniel Mullings (23) gets a layup in a game between No. 1 Arizona and New Mexico State at McKale Center in Tucson, Ariz. Arizona defeated New Mexico State 74-48. 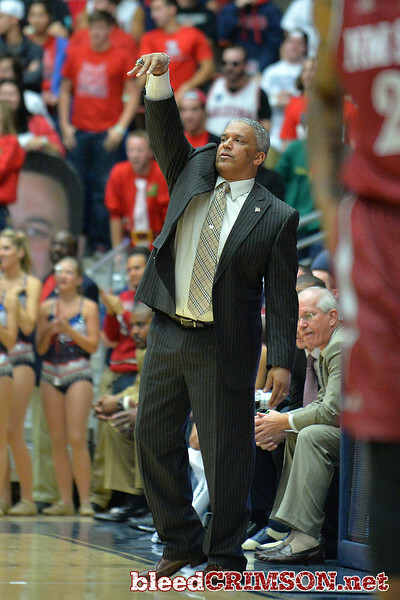 December 11, 2013: New Mexico State Aggies head coach Marvin Menzies calls a play in the first half in a game between No. 1 Arizona and New Mexico State at McKale Center in Tucson, Ariz. Arizona defeated New Mexico State 74-48. 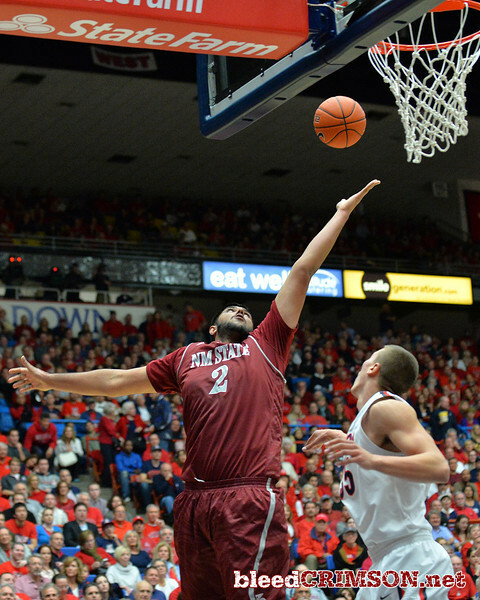 December 11, 2013: New Mexico State Aggies center Sim Bhullar (2) stretches for a rebound in a game between No. 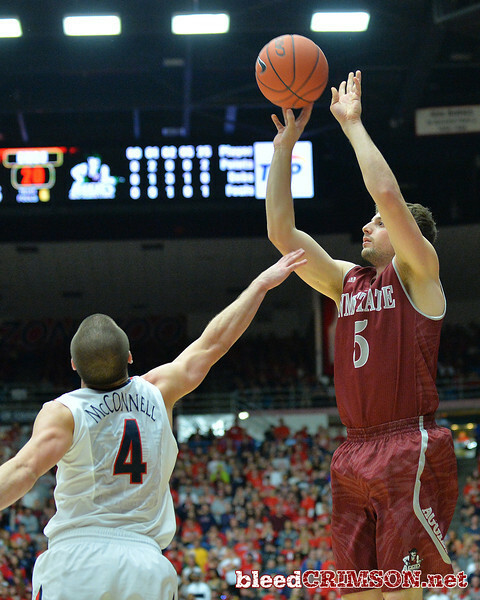 1 Arizona and New Mexico State at McKale Center in Tucson, Ariz. Arizona defeated New Mexico State 74-48. December 11, 2013: in a game between No. 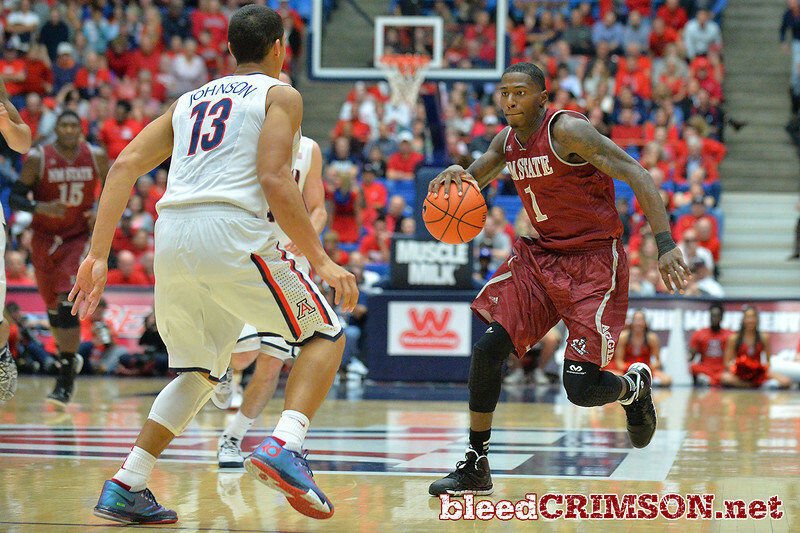 1 Arizona and New Mexico State at McKale Center in Tucson, Ariz. Arizona defeated New Mexico State 74-48. December 11, 2013: New Mexico State Aggies center Sim Bhullar (2) tries to bock a shot attempt from Arizona Wildcats forward Rondae Hollis-Jefferson (23) in a game between No. 1 Arizona and New Mexico State at McKale Center in Tucson, Ariz. Arizona defeated New Mexico State 74-48. December 11, 2013: New Mexico State Aggies guard K.C. Ross-Miller (12) brings the ball up the court in a game between No. 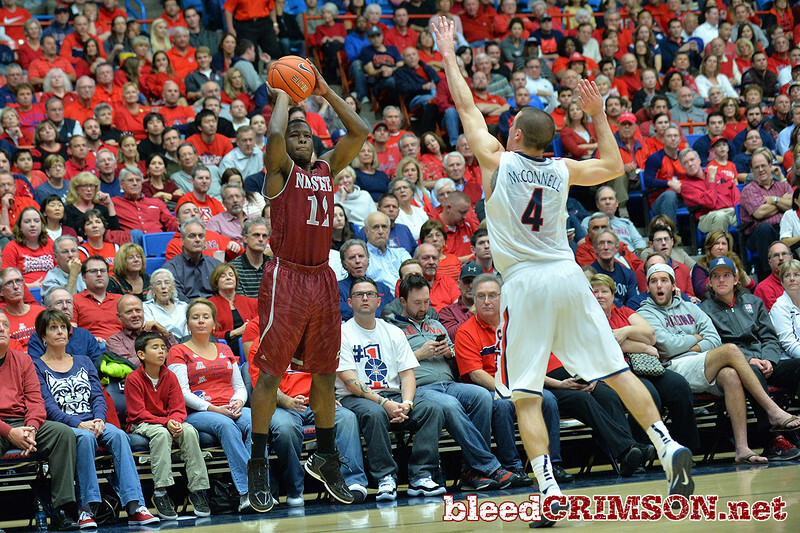 1 Arizona and New Mexico State at McKale Center in Tucson, Ariz. Arizona defeated New Mexico State 74-48. 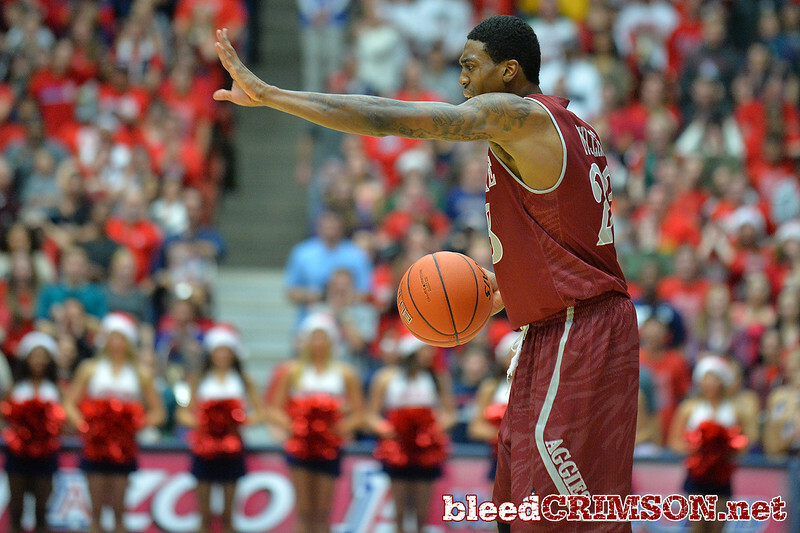 December 11, 2013: Arizona Wildcats forward Aaron Gordon (11) leans in for a shot over New Mexico State Aggies forward Renaldo Dixon (25) in the first half in a game between No. 1 Arizona and New Mexico State at McKale Center in Tucson, Ariz. Arizona defeated New Mexico State 74-48. 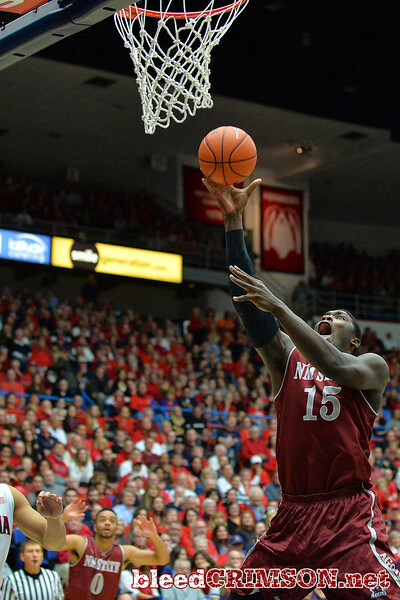 December 11, 2013: New Mexico State Aggies center Tshilidzi Nephawe (15) has his shot blocked by Arizona Wildcats forward Rondae Hollis-Jefferson (23) in a game between No. 1 Arizona and New Mexico State at McKale Center in Tucson, Ariz. Arizona defeated New Mexico State 74-48. 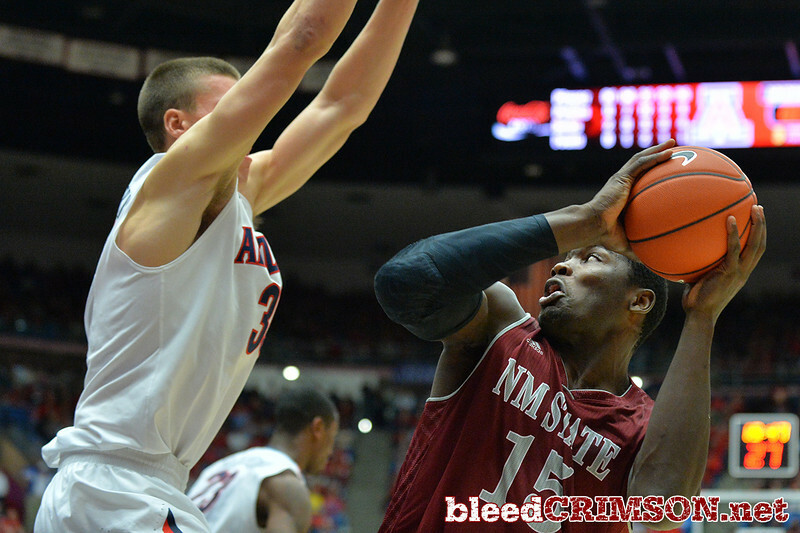 December 11, 2013: New Mexico State Aggies center Tshilidzi Nephawe (15) puts up a shot in a game between No. 1 Arizona and New Mexico State at McKale Center in Tucson, Ariz. Arizona defeated New Mexico State 74-48. 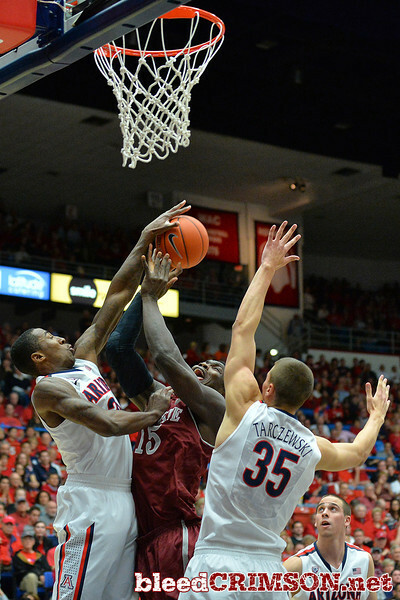 December 11, 2013: New Mexico State Aggies center Tshilidzi Nephawe (15) battles for a rebound against Arizona Wildcats center Kaleb Tarczewski (35) and Arizona Wildcats forward Rondae Hollis-Jefferson (23) in a game between No. 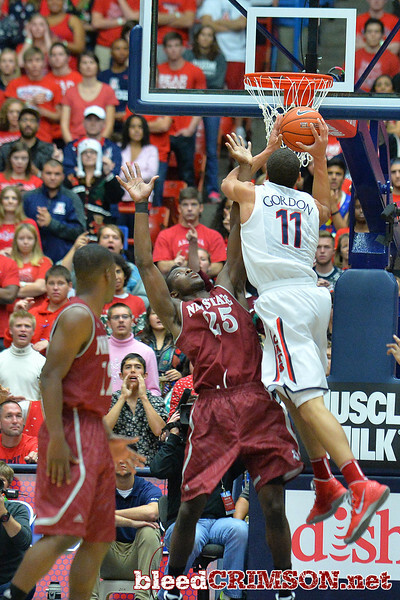 1 Arizona and New Mexico State at McKale Center in Tucson, Ariz. Arizona defeated New Mexico State 74-48. 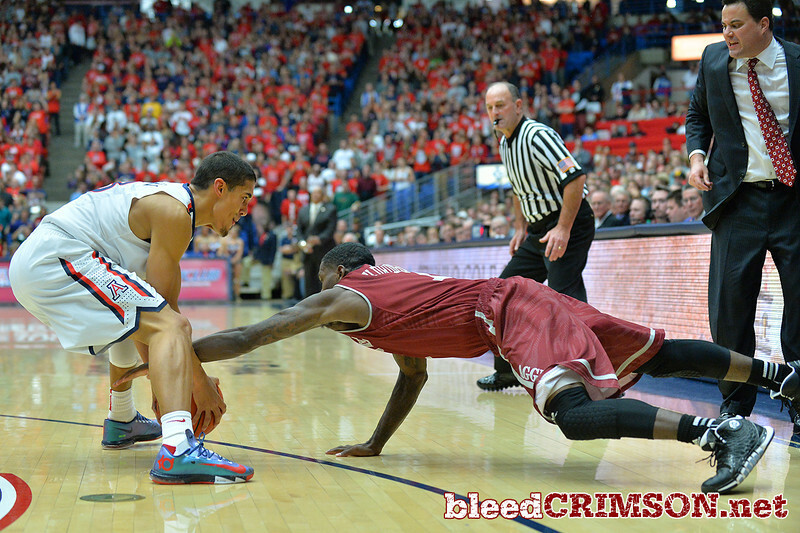 December 11, 2013: New Mexico State Aggies guard DK Eldridge (1) battles for a loose ball in the first half in a game between No. 1 Arizona and New Mexico State at McKale Center in Tucson, Ariz. Arizona defeated New Mexico State 74-48. December 11, 2013: New Mexico State Aggies guard Daniel Mullings (23) tries to get a layup in the first half in a game between No. 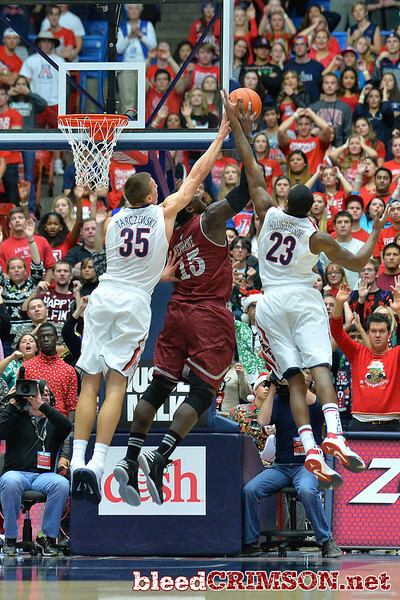 1 Arizona and New Mexico State at McKale Center in Tucson, Ariz. Arizona defeated New Mexico State 74-48. 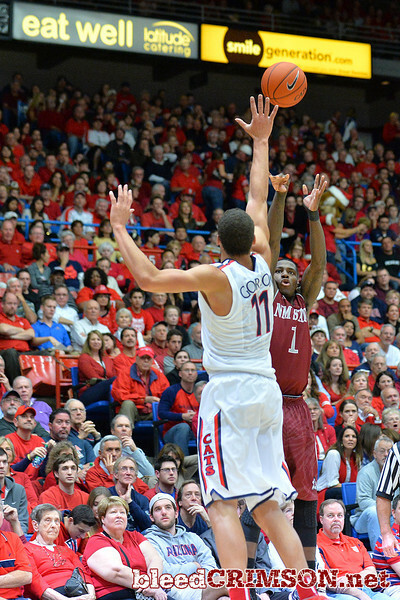 December 11, 2013: New Mexico State Aggies guard DK Eldridge (1) takes a shot over Arizona Wildcats forward Aaron Gordon (11) in the first half in a game between No. 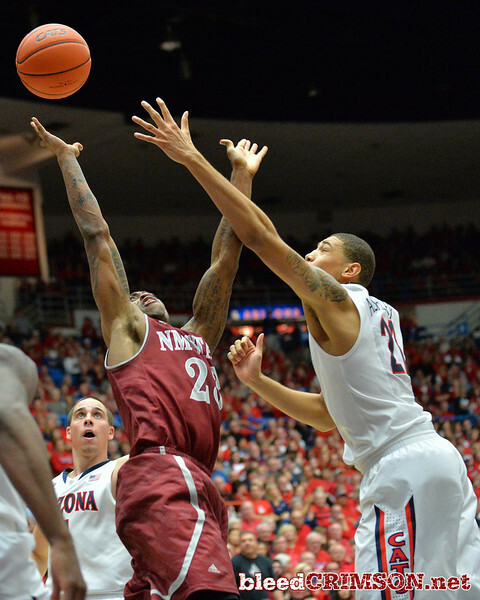 1 Arizona and New Mexico State at McKale Center in Tucson, Ariz. Arizona defeated New Mexico State 74-48. December 11, 2013: New Mexico State Aggies center Sim Bhullar (2) blocks a shot attempt by Arizona Wildcats forward Rondae Hollis-Jefferson (23) in a game between No. 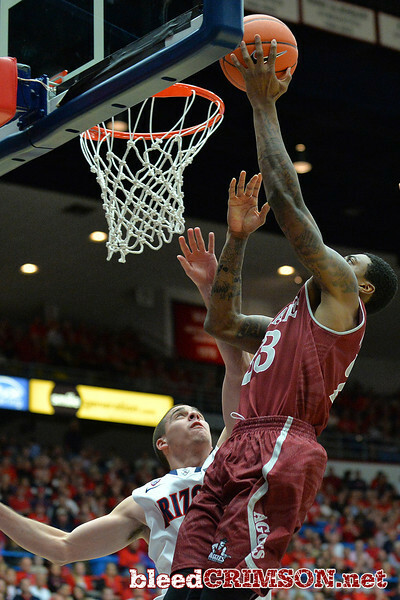 1 Arizona and New Mexico State at McKale Center in Tucson, Ariz. Arizona defeated New Mexico State 74-48. 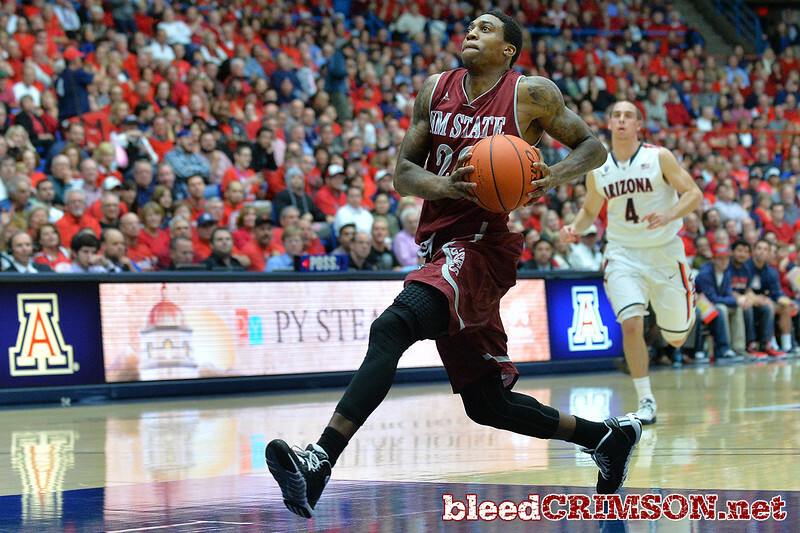 December 11, 2013: New Mexico State Aggies guard K.C. Ross-Miller (12) shoots a three pointer in the first half in a game between No. 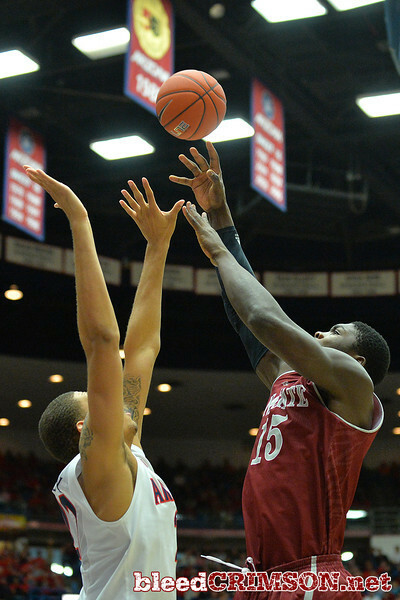 1 Arizona and New Mexico State at McKale Center in Tucson, Ariz. Arizona defeated New Mexico State 74-48. 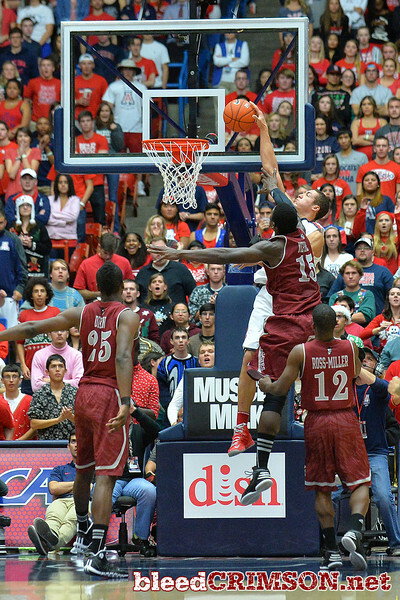 December 11, 2013: New Mexico State Aggies center Tshilidzi Nephawe (15) contests a dunk attempt by Arizona Wildcats forward Aaron Gordon (11) in a game between No. 1 Arizona and New Mexico State at McKale Center in Tucson, Ariz. Arizona defeated New Mexico State 74-48. 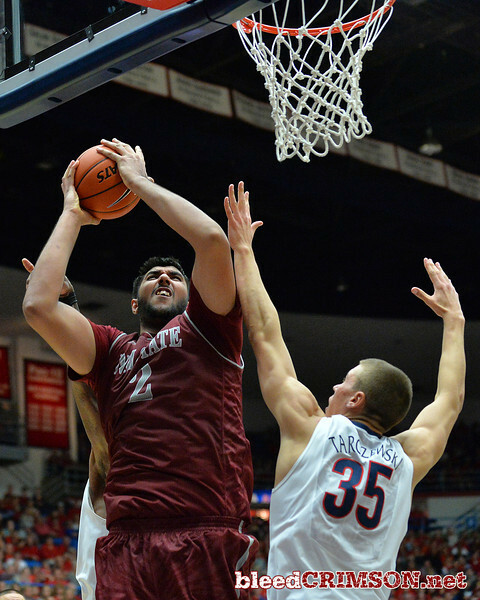 December 11, 2013: New Mexico State Aggies center Sim Bhullar (2) has hit shot contested by Arizona Wildcats center Kaleb Tarczewski (35)in a game between No. 1 Arizona and New Mexico State at McKale Center in Tucson, Ariz. Arizona defeated New Mexico State 74-48. 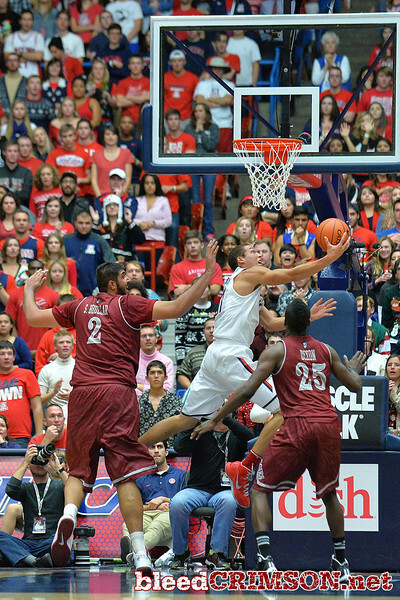 December 11, 2013: Arizona Wildcats forward Aaron Gordon (11) gets past the Aggie defenders for a reverse layup in the first half in a game between No. 1 Arizona and New Mexico State at McKale Center in Tucson, Ariz. Arizona defeated New Mexico State 74-48. 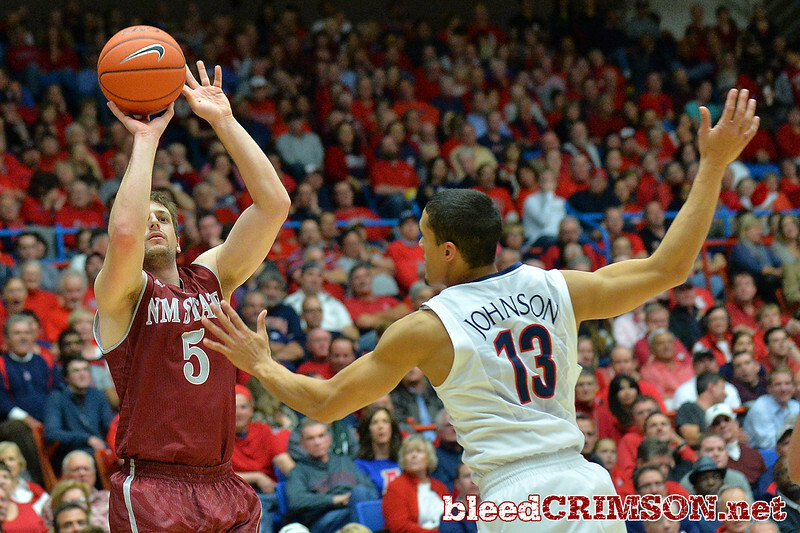 December 11, 2013: New Mexico State Aggies guard Kevin Aronis (5) shoots over Arizona Wildcats guard T.J. McConnell (4) in the first half in a game between No. 1 Arizona and New Mexico State at McKale Center in Tucson, Ariz. Arizona defeated New Mexico State 74-48. December 11, 2013: New Mexico State Aggies guard Daniel Mullings (23) drives to the basket for a breakaway dunk in the first half in a game between No. 1 Arizona and New Mexico State at McKale Center in Tucson, Ariz. Arizona defeated New Mexico State 74-48. December 11, 2013: New Mexico State Aggies guard Daniel Mullings (23) calls out a play on offense in the first half in a game between No. 1 Arizona and New Mexico State at McKale Center in Tucson, Ariz. Arizona defeated New Mexico State 74-48. 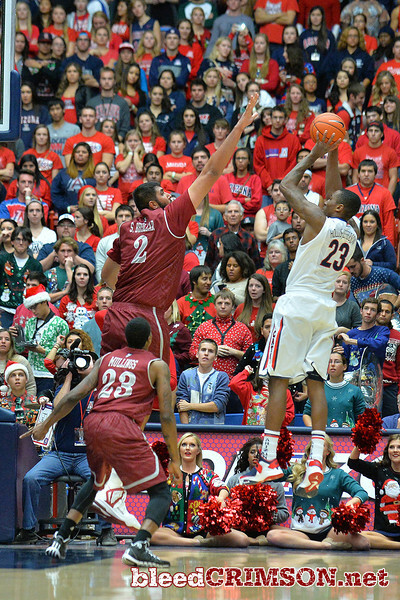 December 11, 2013: New Mexico State Aggies guard Daniel Mullings (23) puts up a floater over Arizona Wildcats guard Nick Johnson (13) in the first half in a game between No. 1 Arizona and New Mexico State at McKale Center in Tucson, Ariz. Arizona defeated New Mexico State 74-48. December 11, 2013: New Mexico State Aggies guard DK Eldridge (1) battles Arizona Wildcats center Kaleb Tarczewski (35) for a rebound in a game between No. 1 Arizona and New Mexico State at McKale Center in Tucson, Ariz. Arizona defeated New Mexico State 74-48. 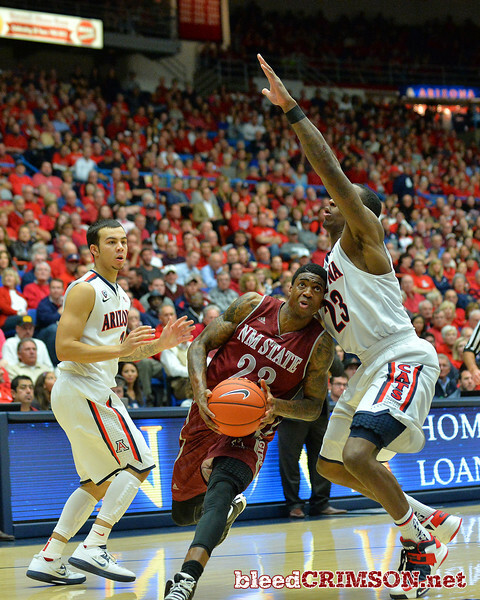 December 11, 2013: New Mexico State Aggies guard Daniel Mullings (23) looks to drive to the basket in a game between No. 1 Arizona and New Mexico State at McKale Center in Tucson, Ariz. Arizona defeated New Mexico State 74-48. 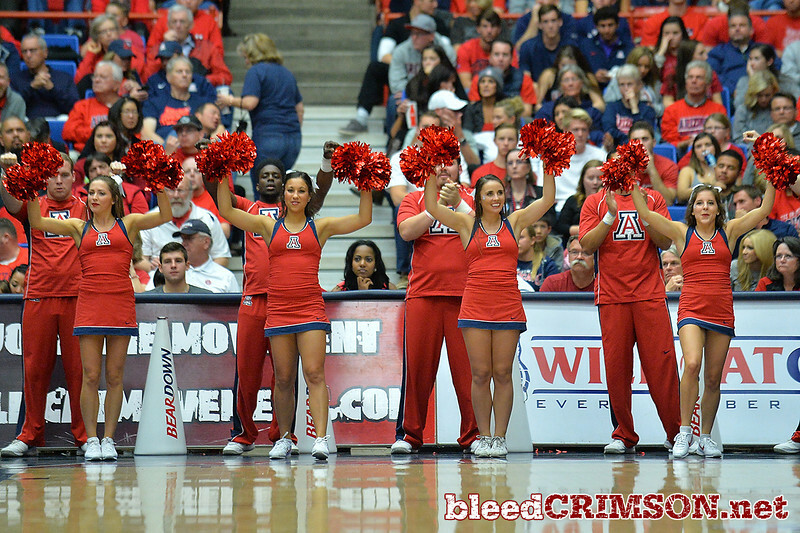 December 11, 2013: The Arizona Wildcats cheerleaders celebrate a Wildcat basket in a game between No. 1 Arizona and New Mexico State at McKale Center in Tucson, Ariz. Arizona defeated New Mexico State 74-48. 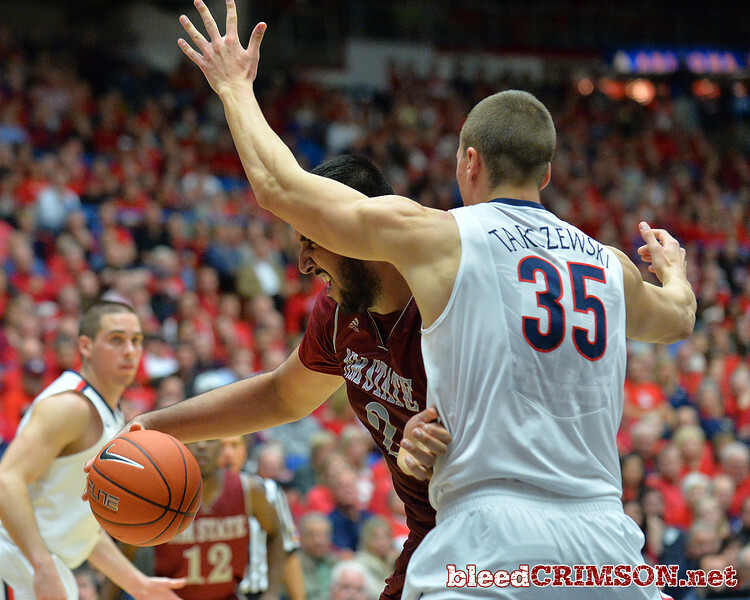 December 11, 2013: New Mexico State Aggies center Tshilidzi Nephawe (15) is defended by Arizona Wildcats center Kaleb Tarczewski (35) in a game between No. 1 Arizona and New Mexico State at McKale Center in Tucson, Ariz. Arizona defeated New Mexico State 74-48. 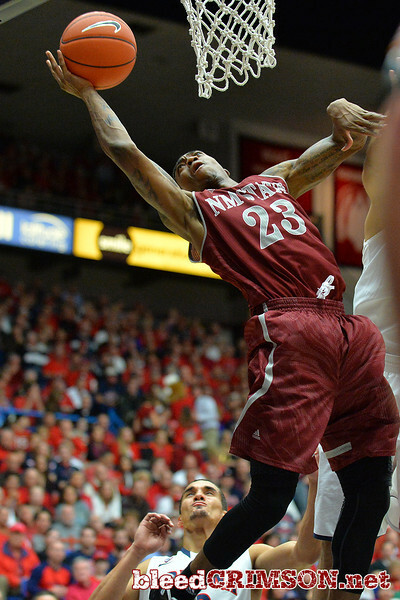 December 11, 2013: New Mexico State Aggies guard Daniel Mullings (23) goes up for a layup in the second half in a game between No. 1 Arizona and New Mexico State at McKale Center in Tucson, Ariz. Arizona defeated New Mexico State 74-48. 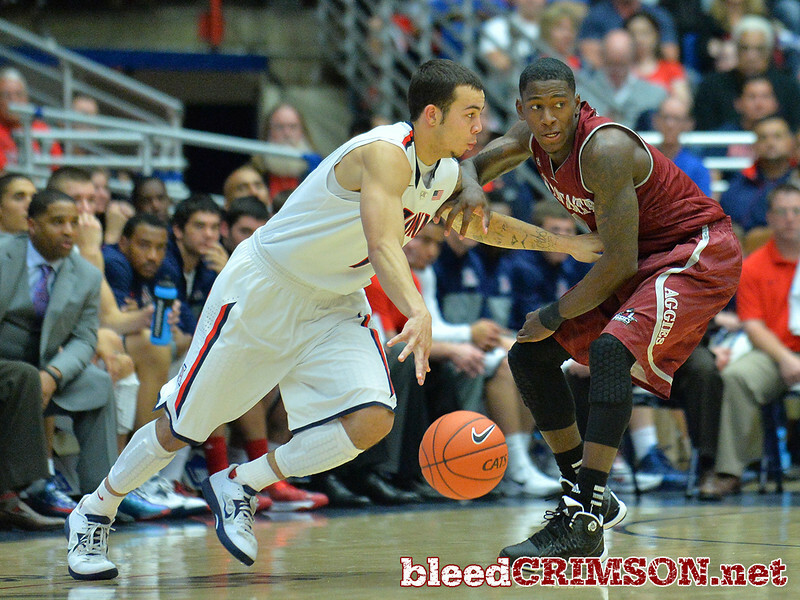 December 11, 2013: New Mexico State Aggies guard Travon Landry (0) guards Arizona Wildcats guard T.J. McConnell (4) in a game between No. 1 Arizona and New Mexico State at McKale Center in Tucson, Ariz. Arizona defeated New Mexico State 74-48. 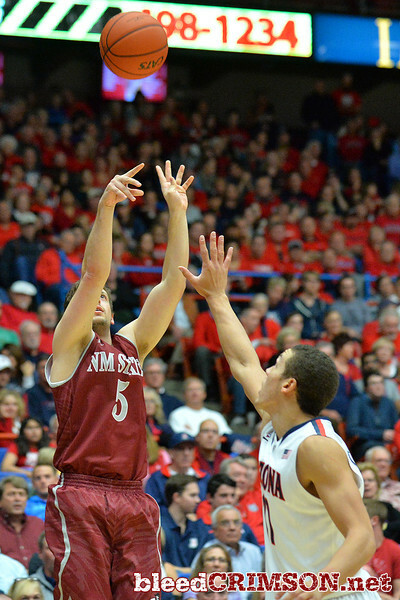 December 11, 2013: New Mexico State Aggies guard Kevin Aronis (5) shoots a three pointer in a game between No. 1 Arizona and New Mexico State at McKale Center in Tucson, Ariz. Arizona defeated New Mexico State 74-48. December 11, 2013: New Mexico State Aggies guard Daniel Mullings (23) loses the ball on the way to the basket in a game between No. 1 Arizona and New Mexico State at McKale Center in Tucson, Ariz. Arizona defeated New Mexico State 74-48. 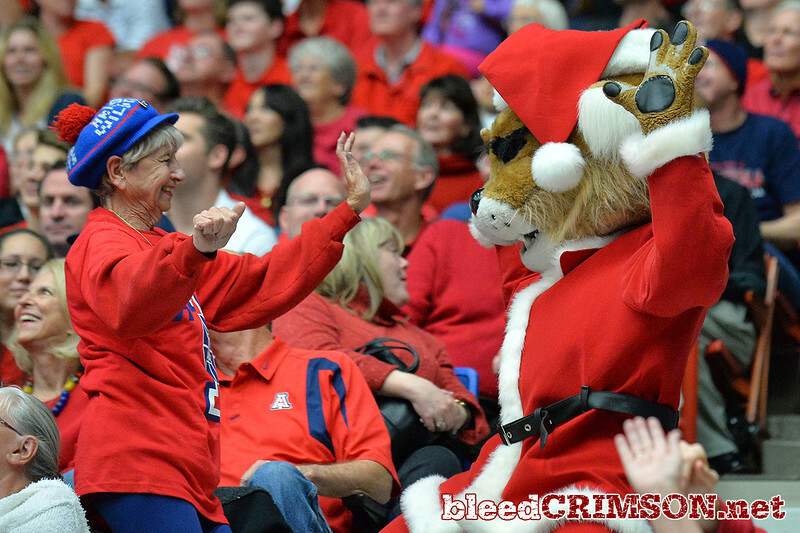 December 11, 2013: The Arizona Wildcats mascot dances with a fan in a game between No. 1 Arizona and New Mexico State at McKale Center in Tucson, Ariz. Arizona defeated New Mexico State 74-48. 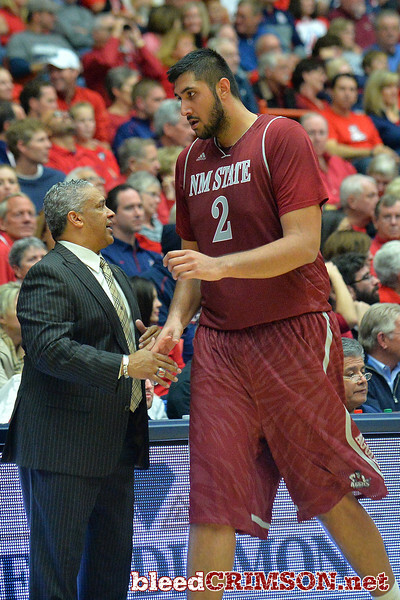 December 11, 2013: New Mexico State Aggies head coach Marvin Menzies greets New Mexico State Aggies center Sim Bhullar (2) as he comes to the bench in a game between No. 1 Arizona and New Mexico State at McKale Center in Tucson, Ariz. Arizona defeated New Mexico State 74-48. 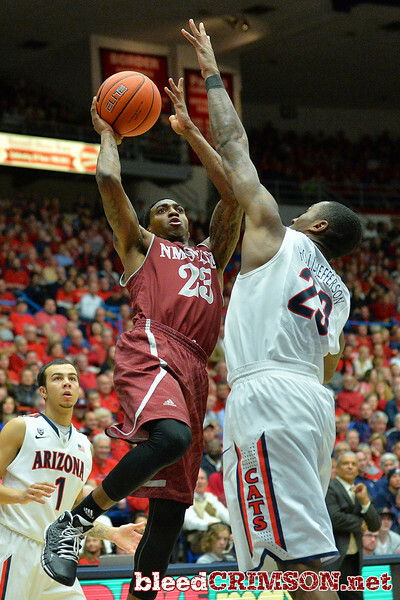 December 11, 2013: New Mexico State Aggies guard Daniel Mullings (23) past Arizona Wildcats forward Rondae Hollis-Jefferson (23) to the basket in a game between No. 1 Arizona and New Mexico State at McKale Center in Tucson, Ariz. Arizona defeated New Mexico State 74-48. 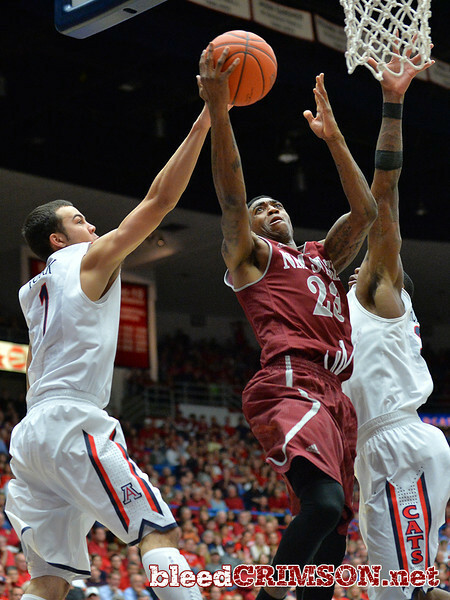 December 11, 2013: New Mexico State Aggies guard Daniel Mullings (23) puts up a shot over Arizona Wildcats forward Rondae Hollis-Jefferson (23) in a game between No. 1 Arizona and New Mexico State at McKale Center in Tucson, Ariz. Arizona defeated New Mexico State 74-48. 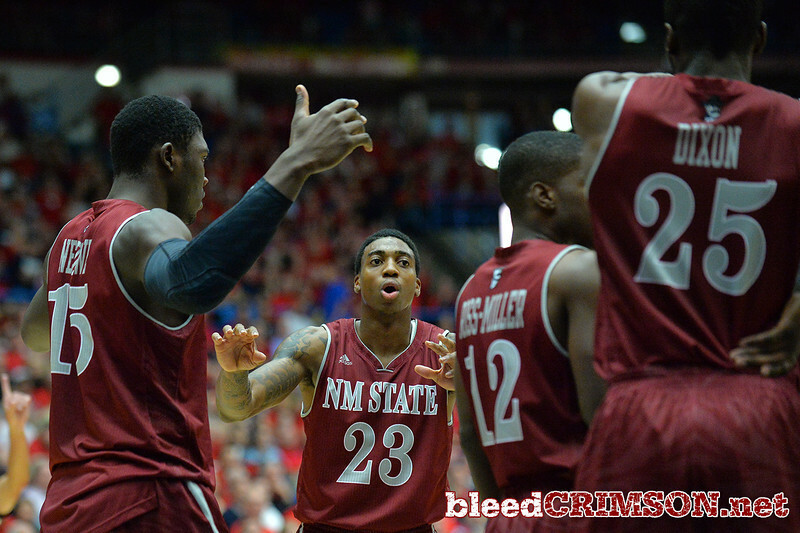 December 11, 2013: New Mexico State Aggies guard Daniel Mullings (23) talks to his teammates during a timeout in a game between No. 1 Arizona and New Mexico State at McKale Center in Tucson, Ariz. Arizona defeated New Mexico State 74-48. 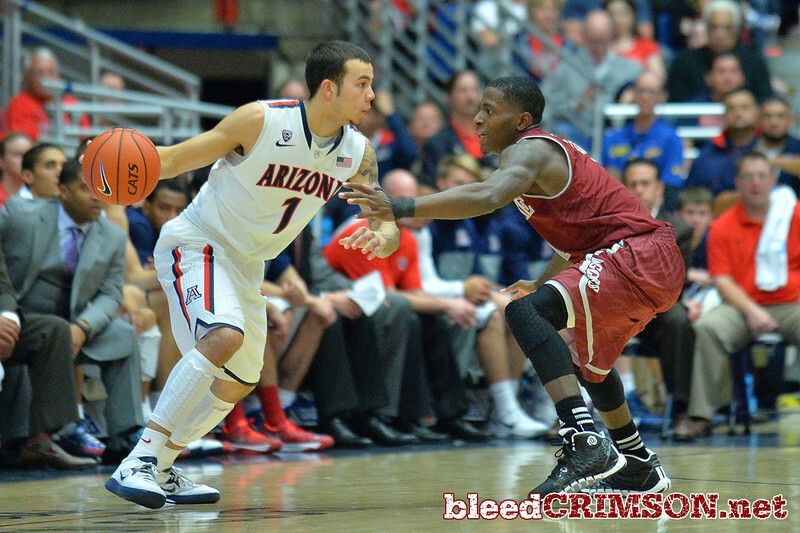 December 11, 2013: New Mexico State Aggies guard DK Eldridge (1) guards Arizona Wildcats guard Gabe York (1) in the second half in a game between No. 1 Arizona and New Mexico State at McKale Center in Tucson, Ariz. Arizona defeated New Mexico State 74-48. 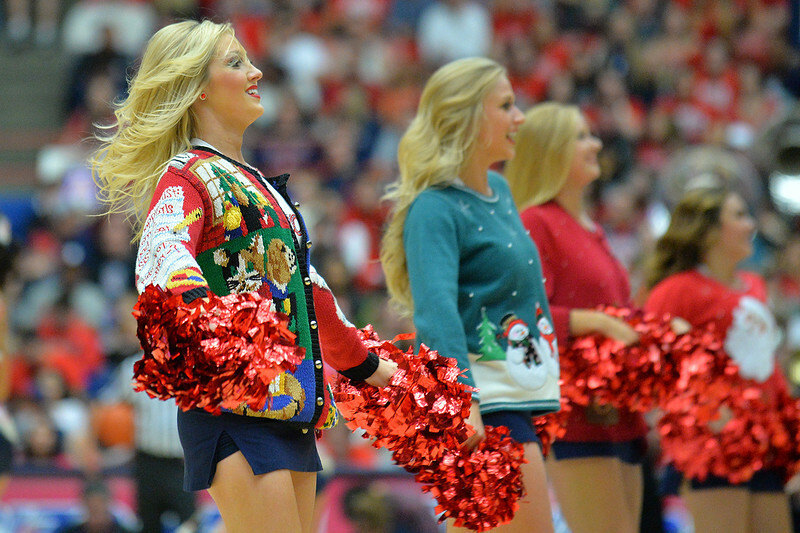 December 11, 2013: The Arizona Wildcats dance team performs in a timeout in a game between No. 1 Arizona and New Mexico State at McKale Center in Tucson, Ariz. Arizona defeated New Mexico State 74-48. 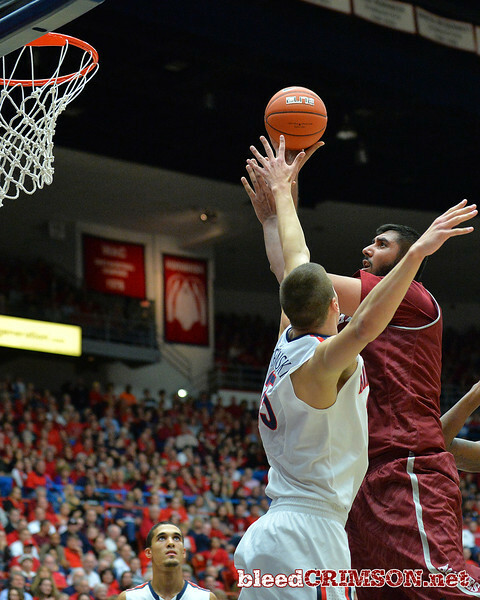 December 11, 2013: New Mexico State Aggies center Sim Bhullar (2) battles for position in the paint against Arizona Wildcats center Kaleb Tarczewski (35) in a game between No. 1 Arizona and New Mexico State at McKale Center in Tucson, Ariz. Arizona defeated New Mexico State 74-48. 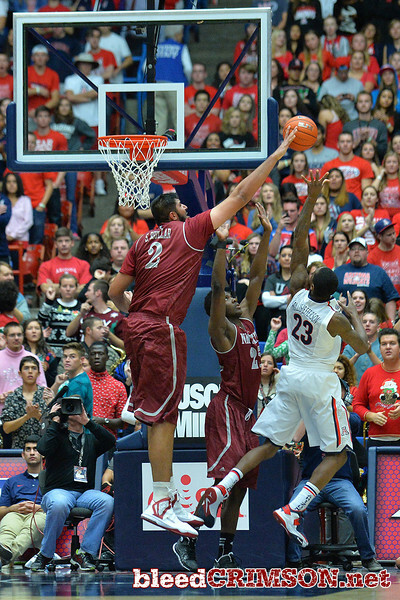 December 11, 2013: New Mexico State Aggies center Sim Bhullar (2) puts up a shot over Arizona Wildcats center Kaleb Tarczewski (35) in a game between No. 1 Arizona and New Mexico State at McKale Center in Tucson, Ariz. Arizona defeated New Mexico State 74-48. 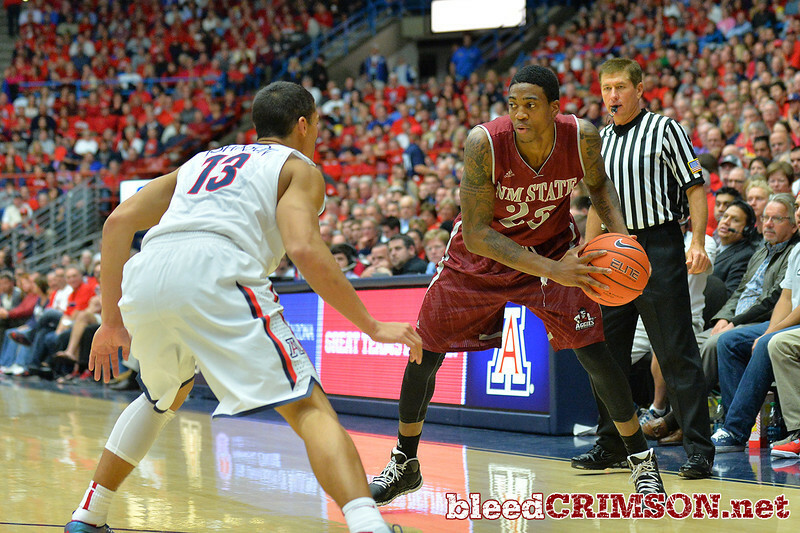 December 11, 2013: New Mexico State Aggies guard Daniel Mullings (23) and Arizona Wildcats forward Brandon Ashley (21) battle for a rebound in a game between No. 1 Arizona and New Mexico State at McKale Center in Tucson, Ariz. Arizona defeated New Mexico State 74-48. 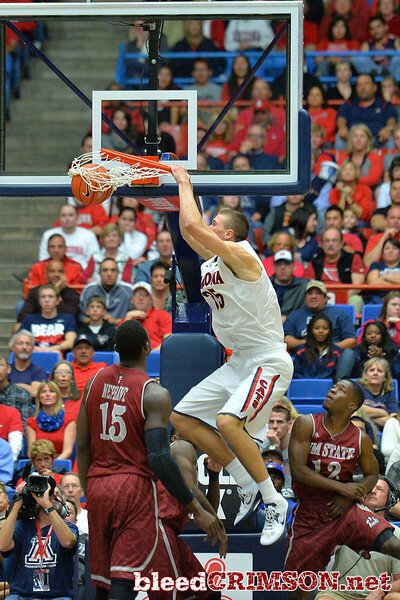 December 11, 2013: Arizona Wildcats center Kaleb Tarczewski (35) gets a dunk in the second half in a game between No. 1 Arizona and New Mexico State at McKale Center in Tucson, Ariz. Arizona defeated New Mexico State 74-48. 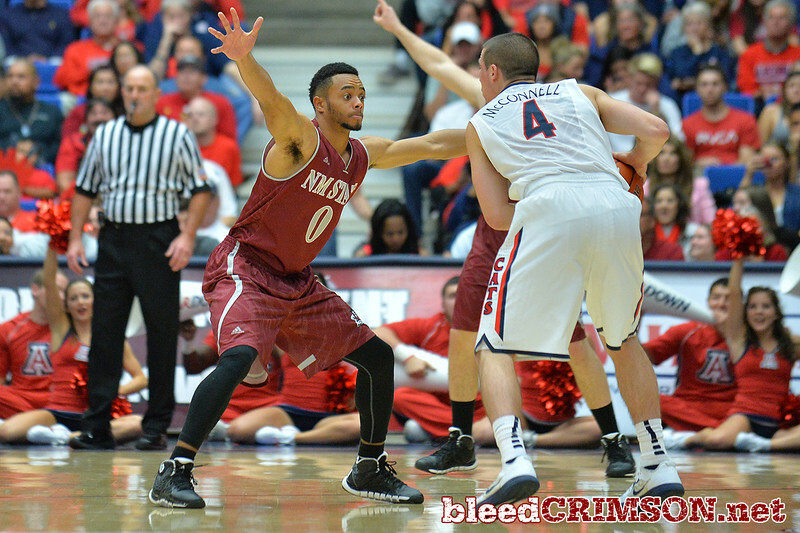 December 11, 2013: New Mexico State Aggies guard DK Eldridge (1) brings the ball up the court in the second half in a game between No. 1 Arizona and New Mexico State at McKale Center in Tucson, Ariz. Arizona defeated New Mexico State 74-48. 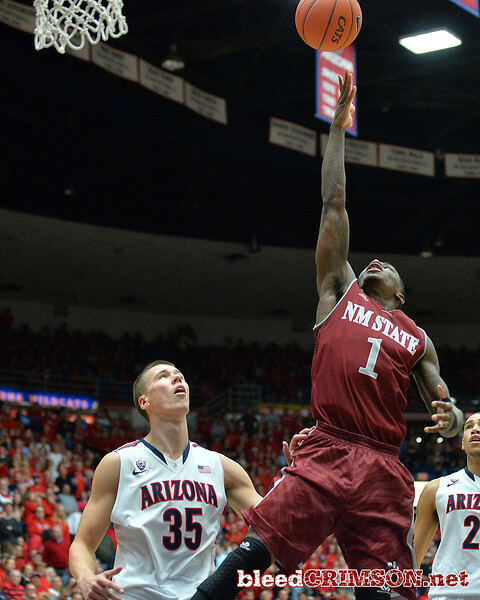 December 11, 2013: New Mexico State Aggies guard DK Eldridge (1) puts up a shot in a game between No. 1 Arizona and New Mexico State at McKale Center in Tucson, Ariz. Arizona defeated New Mexico State 74-48. 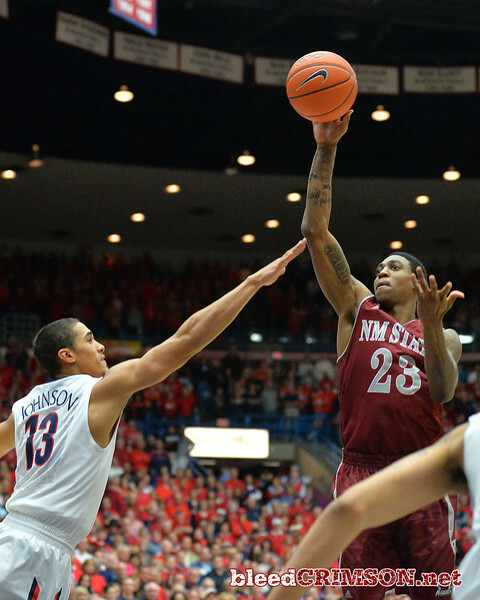 December 11, 2013: New Mexico State Aggies guard Kevin Aronis (5) shoots over Arizona Wildcats forward Brandon Ashley (21) in a game between No. 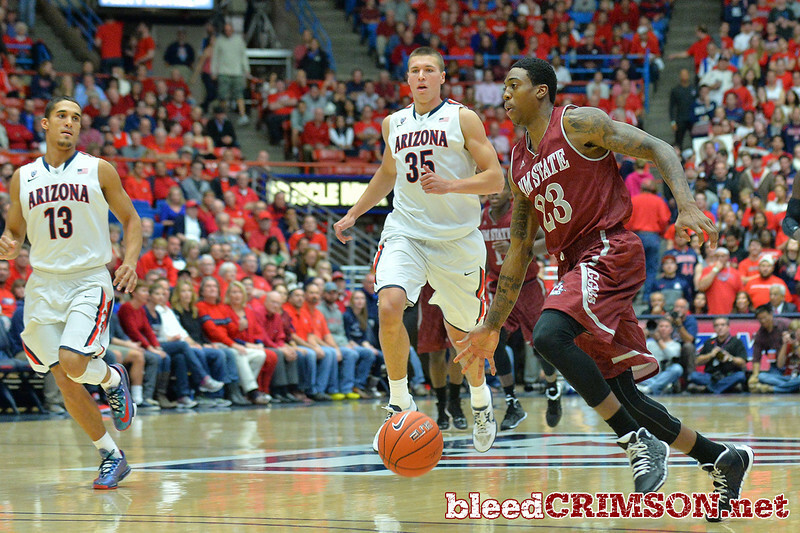 1 Arizona and New Mexico State at McKale Center in Tucson, Ariz. Arizona defeated New Mexico State 74-48.